What Bullbuster Fluorocarbon Do I Use? So you are heading out to fish and you are preparing your fishing tackle for the fishing adventure. Decisions, decisions, decisions. What rod? What reel? What line test do I use? What lures? What fluorocarbon do I use? These are all questions that can lead to a successful fishing day or a not so great fishing day. But remember a bad day fishing is ALWAYS better than a good day at work! So I am going to review how I select my Bullbuster Fluorocarbon line strength for the target fish species. The saltwater species I fish for sea trout, snook, and redfish. For these fish I generally use Bullbuster 40lb Fluoro tied to Bullbuster 30lb Braid. This setup is perfect for all these type of fish and gives you the firepower to muscle them out of the mangroves or stop a snook from running into some type of structure. Now there is one fish that needs special attention....the tarpon...this is a different animal. The tarpon you are fishing for needs to broken down by size. Small juvenile tarpon up to lets say 30lb can be taken with fluoro in the 40lb test range...above 30 lbs to lets say 40-60lb tarpon I would use at least 50lb Bullbuster floro. Tarpon over 60lbs I would definitely use at least 60-80lb fluoro. Now when fishing for tarpon you must use longer lengths of flouro at least 4 foot for the smaller size tarpon and at least 6 foot or more for the larger tarpon. This is due to the acrobatic jumps and spins these fish will produce during their epic fight with you! Remember you can never have enough Bullbuster floro! Have a variety of test strength at all times ready to go. I have from 20lb all the way up to 80lb fluoro in my boat ready to go at all times as well as my freshwater tackle bag. By selecting the right Bullbuster fluorocarbon for the fish species and fishing conditions will greatly improve your catch. It is strong, abrasive resistant and great concealment. I hope you enjoyed my article and it helps you catch more fish. Remember Spend More Time Fishing and order your fishing lines at Bullbuster.net. I will start on my freshwater species first....these fish like the peacock bass and largemouth bass can be very finicky on certain days. 1) What type of water will I be fishing in? Ultra clear, clear, murky, very murky? In ultra clear water I always use fluorocarbon. 2) Is there structure? Will there be logs, rocks, rock ledges, pillings? Then size of fish possibly in the area or sneak attack surprise fish that could be in area such as snook or tarpon. Most of the time while fishing for peacock bass and bass I will go with Bullbuster 20lb fluoro. The Bullbuster flouro is very strong, and abrasive resistant and its great to conceal your presentation to fish. Now I will move up to 30lb fluoro for these fish if there are jagged rock ledges very near by or logs/branches in the water in area where I am fishing. A big bass or peacock bass will take you down those ledges to break you off. The peas especially they are very hard fighters and head shakers. 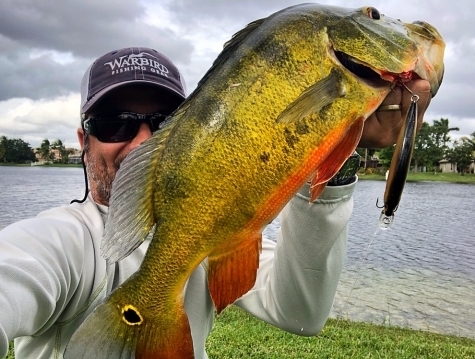 I have fished for peacock bass for over 25 years and listen to me .....never underestimate those fish....the day a big one shows up and hits your bait or lure you do not want to lose him. Use Bullbuster flouro tied straight to the Bullbuster Braid. I use about 30 to 36 inches of flouro.